There are fewer forces more powerful in this world than the craving for late-night munchies after a long evening of, uh, revelry. Unfortunately, the landscape of options up for grabs at such hours will soon grow smaller now that McDonald's is preparing to cut the number of items available on its late-night menu. 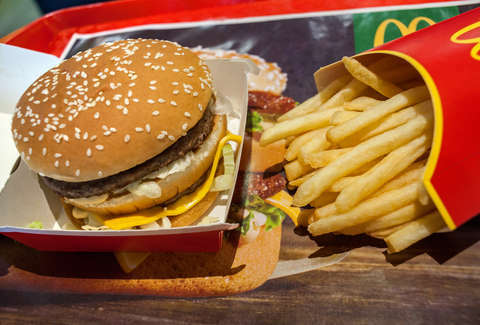 Beginning April 30, McDonald's will be reducing the number of items available on its "After Midnight" menu, in an effort to streamline service for people who stop in for a bite to eat in the wee hours. The menu, which is served at participating Mickey D's locations from midnight through 5am, will be slimmed down by five items in particular. You'll no longer be able to order Signature Crafted Recipes, artisan-grilled chicken sandwiches, buttermilk-crispy-chicken sandwiches, buttermilk crispy tenders, Filet-O-Fish, and premium salads, according to a report from Business Insider. In addition, bagel sandwiches and snack wraps that have been served during late-night hours at certain locations will also be dropped from the After Midnight menu. "We always want our customers’ experiences to be simple, smooth and delicious -- any time of day. That means, day and night, we’re always looking for ways to serve them even better," the company said in a statement about the change. "Starting April 30 (at participating McDonald’s restaurants nationwide),we’ll be simplifying what’s served after midnight so customers can get the most popular favorites as fast as possible." Luckily, you'll be able to to grab much more than just a soda and fries when you stop in after midnight. The refreshed menu will still offer Big Macs, Quarter Pounders, Chicken McNuggets, fries, Sweets & Treats, Happy Meals, McCafe beverages, and, as its name suggests, items on the chain's All-Day Breakfast menu. Also, all the items that are being stripped from the current After Midnight will still be available during the day. Of course, unless the Golden Arches is the only late-night fast food option in your area, this may be a good time to explore the bounty of other well-known spots where you can enjoy a whole spread of snacks no matter when your long night out is over.